Temperature : In summer, temperature between 47degree Celntigrade(max) and 25degree centigrade(min). Summer are very hot. May is the hottest month in a year. In winter, temperature is very pleasant, cool and good for all tourist activities. Situated on the banks of the Sabarmati River, Ahmedabad was founded by the Muslim ruler, Sultan Ahmed Shah in 1411 AD. This city is also called as “Manchester of the East:” because of its thriving textile industry. The old walled city with its intriguing labyrinth of balance called pols and the exquisitely carved wooden mansions, or havelis. This is a city of architectural delights, home to the Indo-Saracenic style, a blend of Hindu and Muslim architectural ideals. The newer part of the city is dotted with architecture of more contemporary design. Apart from being a vibrant and prosperous business centre. 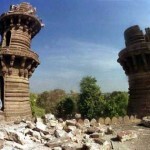 Ahmedabad has a great deal more to offer to visitors. Air: International and Domestic airlines connect Ahmedabad to Bombay, Delhi and major cities of India. The city is also linked to Muscat, London and New York. Rail:Ahmedabad is linked to Bombay, Delhi, Kolkata, Chennai and other major cities in India by rail. Road:NH 8 & 88 and State Highways connect Ahmedabad to major cities in India. 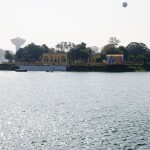 Kankaria Lake: Constructed by Sultan Qutb-ud-Din, this lake is a popular recreational spot for people of Ahmedabad. Landscaped gardens, terraced slopes, and zoo surround the lake, Aquarium and Balvatika. 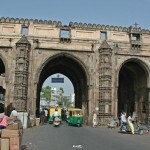 Teen Darwaja: This triple arched gateway was originally meant to serve as the royal entrance to the Maidan Shahi or Royal Square. 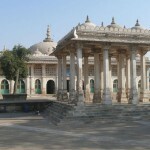 Hatheesing Jain Temple: This temple is dedicated to the 15th Jain apostle – Dharamnath. It is built of pure white marble and embellished with intricate carving. Sarkhej Roza: Sarkhej comprises one of the most elegant architectural complexes or Ahmedabad; the buildings are remarkable for the complete absence of arches and the use of pierced stone trellises. Shaking Minarets:The Shaking Minarets of Sidi Bashir’s Mosque has generated tremendous curiosity. The two minarets are designed such that if one is shaken, the other trembles as well. 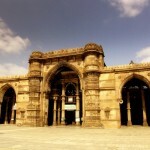 Sidi Saiyad Mosque:Ahmedabad has a large number of mosques. One of the most famous is Sidi Saiyad Mosque built in 1571 AD, which is acclaimed for it’s splendid filigree screen, framed in the ten semicircular windows . Dada Hari Vav: This step-well manifests a unique architectural feature of Gujarat. Step-wells were built to provide travellers with water and cool resting place. 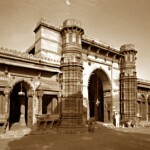 Jumma Masjid:It is considered to be one of the most beautiful mosques in western India. This mosque, built in 1423 AD, is outstanding for its grand scale, superb proportions and exquisite workmanship. Rani Sipri Mosque: A small, exquisite mosque built in 1514 by a queen of Mehmud Shah Begda, The queen herself lies buried here. Gandhi Ashram: The Gandhi Ashram along the Sabarmati River was once Gandhiji’s nerve-centre for the Indian Freedom Movement. 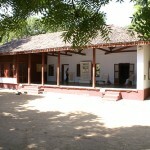 The Gandhi Memorial Centre, Library and much more can be seen at the Ashram. Pols: Pols are an integral part of old Ahmedabad. It nurtures in its folds, pages of history, a breath of harmony and a showcase of exquisite architecture. 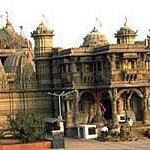 Akshardham Temple: This temple in Gandhinagar is built in the memory of Lord Swaminarayan. 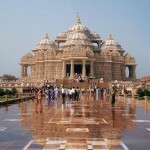 Built of pink sandstone, Akshardham is a unique and majestic cultural complex, housing exhibitions and multimedia shows. 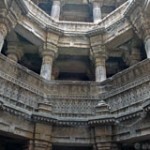 Adalaj Vav: It is the best-preserved well of its kind to Gujarat. It was built in 1499. The three-stepped entrance descends into an open court from where a single arched heavily decorated entrance leads to a corridor. The corridor has four pavilion constructions and is five storiesunderground upto the well. 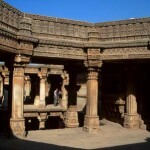 Patan: This city is famous for its architectural wonders built during the Solanki dynasty. Patan is an important weaving centre for geometrically patterned Patola Sarees. Modhera: The Sun Temple at Modhera, built between 1026-27, is positioned in such a manner that the rising sun’s rays illuminate the deity in the inner most sanctum sanctorum through the main entrance. 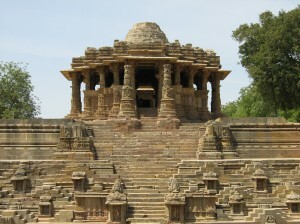 This temple is dedicated to the Sun God, Surya. The stone sculptures here, are similar to those found at Konarak and Khajuraho temples. Showcasing Culture:The museums definitely worth a visit are the Calico Museum with an impressive collection of old textiles with associated machinery and tools, t he Tribal Museum which depicts the history, culture and lifestyle of the numerous tribes in Gujarat and The Shrey as Polk Art Museum, which houses a collection of traditional folk arts, crafts, costumes and jewellery of various communities from the state. 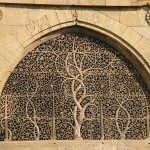 This entry was posted in Ahmedabad, Gujarat and tagged Adalaj Vav, ahmedabad area, ahmedabad city guide, ahmedabad photo, ahmedabad photos, ahmedabad travel, ahmedabad weather, Akshardham Temple, bangalore ahmedabad, chennai ahmedabad, Dada Hari Vav, Gandhi Ashram, Hatheesing Jain Temple, Jumma Masjid, Kankaria Lake, Modhera, mumbai ahmedabad, Patan, Pols, pune ahmedabad, Rani Sipri Mosque, Sarkhej Roza, Shaking Minarets, Showcasing Culture, Sidi Saiyad Mosque, Sun temple, Teen Darwaja, weather in ahmedabad, website ahmedabad. Bookmark the permalink.